All I’ve done is run fast. I don’t see why people should make much fuss about that. 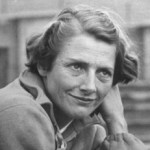 Fanny Blankers Koen was a Dutch athlete, best known for winning four gold medals at the 1948 Summer Olympics in London. She accomplished this as a 30-year-old mother of two, during a time when many disregarded women's athletics. Her background and performances earned her the nickname "the Flying Housewife". She was the most successful athlete at the 1948 Summer Olympics.